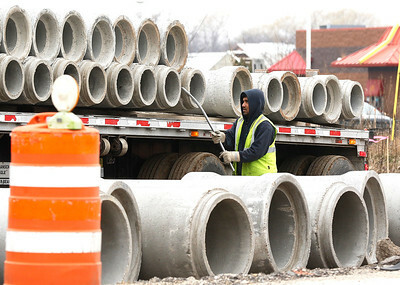 H. Rick Bamman - hbamman@shawmedia.com A worker with ALF Cartage unloads concrete pipe along Rt. 14 south of Rt 176. Work is ongoing to rebuild and widen Route 14 from West Lake Shore Drive in Woodstock to just south of Crystal Lake Avenue. The project widens two lanes in each direction, separated by a 22-foot landscaped median. A 10-foot bike path will be included from Lake Shore Drive to just past MCC. Traffic signals will be improved or installed at eight intersections along the route. H. Rick Bamman - hbamman@shawmedia.com A worker with Viridian Enterprises marks a concrete pipe before cutting for the Rt. 14 project in Crystal Lake on Tuesday, March 29. H. Rick Bamman - hbamman@shawmedia.com A Viridian Enterprises crew begins work on installing concrete pipe on the west side of Rt. 14 in Crystal Lake on Tuesday, March 29. 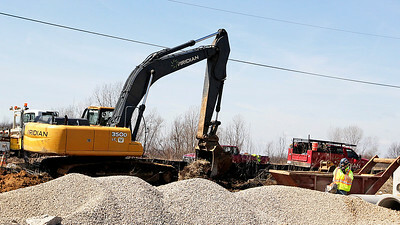 Work is ongoing to rebuild and widen Route 14 from West Lake Shore Drive in Woodstock to just south of Crystal Lake Avenue. The project widens two lanes in each direction, separated by a 22-foot landscaped median. A 10-foot bike path will be included from Lake Shore Drive to just past MCC. Traffic signals will be improved or installed at eight intersections along the route. 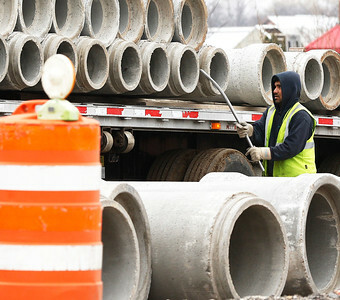 A worker with Viridian Enterprises marks a concrete pipe before cutting for the Rt. 14 project in Crystal Lake on Tuesday, March 29.